This book brings together some of the best thinking about how cities work in today’s technology-enabled world. 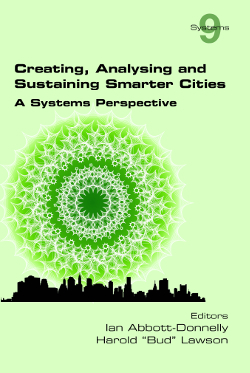 It reveals insight from many system perspectives to show in detail how cities can become smarter, be understood and meet the needs of the citizens. It explains how cities can sustain themselves under the increasing pressures of change. An important thread between the authors is that from whatever point of view you start from in the city it is vital to be able to see the city as a complex adaptive system. Cities are extremely complex in their nature, being highly connected socially, economically and environmentally. The systems perspective allows underlying patterns, threats and opportunities to be understood and worked with in a constructive manner. All of the systems perspectives recognise that people form the true fabric of the city. The architecture, the technology and the systems are transient and need constant management and renewal to continue to improve the lives of the citizens. The city is a diverse system of systems that attracts the majority of the planets population. It is wholly dependent on the natural systems in which it resides to supply it with clean air, usable water, food, energy and a valuable quality of life. Without a systems perspective cities quickly become unsustainable. For the first time technology is now able to integrate the systems within cities making them more efficient and more effective while using resources wisely. Increasingly cities are working together across the globe to learn how make good use of technology to improve the lives of citizens. This book explains how this can be done. A must read for people who operate city systems, design city policy and provide products and services to cities that aim to improve the quality of city life.